Haven't received anything? please contact support@rocketbingo.co.uk for assistance. tired of boring bingo sites? Rocket Bingo - Forget boring bingo sites! Welcome to Rocket Bingo, our team has extensive experience in the world of online bingo. We like to think we know what you like, but if we're missing something, get in touch, this is your bingo website. We'll bring you unique bingo promos that can't be found on any other bingo sites, so play bingo and slots with us! You won't regret coming on-board AND we'll give you up to 500 Free Spins on Fluffy Favourites when you do. Remember to check us out on FB and Twitter too! More About Rocket Bingo. Psst.. We've got no deposit, free bingo! Having launched back in 2014 we no longer consider ourselves to be one of the new bingo sites, we’ve learnt a lot in our time and we sincerely hope that has made us a better bingo destination for you! Since firing up our rocket engine, we’re proud of what we’ve achieved in what is still a fairly small ‘space’ of time - pun intended. Our aim upon lift-off was to offer a truly unusual bingo experience. We’ve constantly been able to do this by offering a range of exclusive promotions. Our promotions have sometimes been referred to as ‘wacky’, but we’ll just go with ‘wonderful’. Take for example our ‘Loo Roll Rocket’ (build a rocket from loo rolls), or our ‘Pimp my Pumpkin’ (carve a rocket pumpkin) competition. Which other bingo sites uk have such personality and fun? The best thing about Rocket Bingo, aside from the massive jackpots, is that things are always improving. Our UK based team are constantly developing new bingo and slots games, our jackpots just keep on soaring and as we grow, we’re able to offer more free bingo games with larger prizes for all to enjoy! It really is onwards and upwards as we become one of the best free bingo sites on the market! One of our proudest moments to date was in 2016 when we were voted the ‘Best Jumpman Gaming Bingo Site’ by Which Bingo. The best thing about scooping this prize was that it was player voted, meaning it was our members who won it for us! Thanks a million, our spacemen will be forever grateful. If you've been playing at Rocket Bingo for a while, you'll notice that fresh for 2018 we have had a cool new design overhaul which has seen us update to a much more sleek look at the same time as revamping our bingo bringing you hundreds more UK slots titles - the same selection in fact as our well known sister site Slot Games! Also, we've noticed that just about everyone is joining us from a mobile phone these days so we've seriously upped our game (pun intended) in terms of making things fit your screen and work smoothly - no more popup boxes for 2018! Rocket Bingo is proud to offer a wide selection of exclusive bingo games. What started off with ‘Genuine Free Bingo’ in 2015 spread to become a whole suite of exclusive games. As of 2018 we now have 3 exclusive rooms, 2 of which are free and require no card details to play (more coming soon). Watch this space! Our Facebook page has proven a popular haunt for our players. If you don’t already, you should like it (click the FB logo in our footer) and stay tuned for chances to win a variety of different vouchers and prizes. We’re regularly running mini competitions which are often open to both members and none members – these will generally take place with no warning – so you must keep a regular check on our page. Also, launched in 2017 there is a special feature called ‘Rocket Puzzles’, found exclusively on our Facebook page. Every Wednesday we will be hosting a little puzzle styled competition where you can win freebies such as vouchers and Rocket bingo credit for those entrants who are funded. Remember, as mentioned above we are ‘your’ bingo destination– we’ve proven this by letting players organise and name competitions and ultimately by winning the Which Bingo award in 2016! We’re always listening to hear new ideas that we could use to sculpt our future. If you have any suggestions for improvements – drop us a line via support or by connecting with our Facebook page. So, if you’re new to the game or you’ve become bored of other bingo brands, we’ve got you covered. Climb onboard, we’ll be glad to welcome you, 2018 is going to be the biggest year yet! 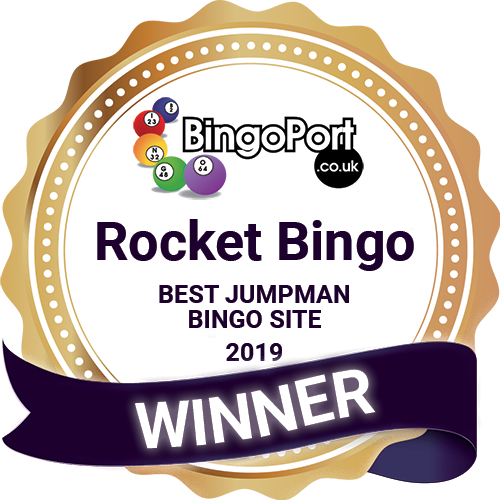 Rocket Bingo is operated by Jumpman Gaming Limited which is licensed by the UK Gambling Commission ('UKGC') for customers in Great Britain and the Alderney Gambling Control Commission ('AGCC') for customers outside of Great Britain. All games on Rocket Bingo are regulated by the UKGC or both the UKGC and AGCC. Registered business address (no correspondence): Inchalla, Le Val, GY9 3UL, Alderney.